This is painful. I hope you don't have to understand it. It may help you to know that you will probably lose data if you merge accounts. In some cases you will be better off to avoid account merging. If you're reading this, however, you probably do need to know how it goes. 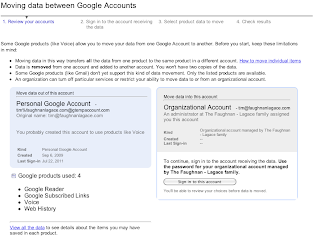 Before you begin, consider reading a post from November 2011 2010 - Why you may want to wait on the new Google Apps services - identity collisions. 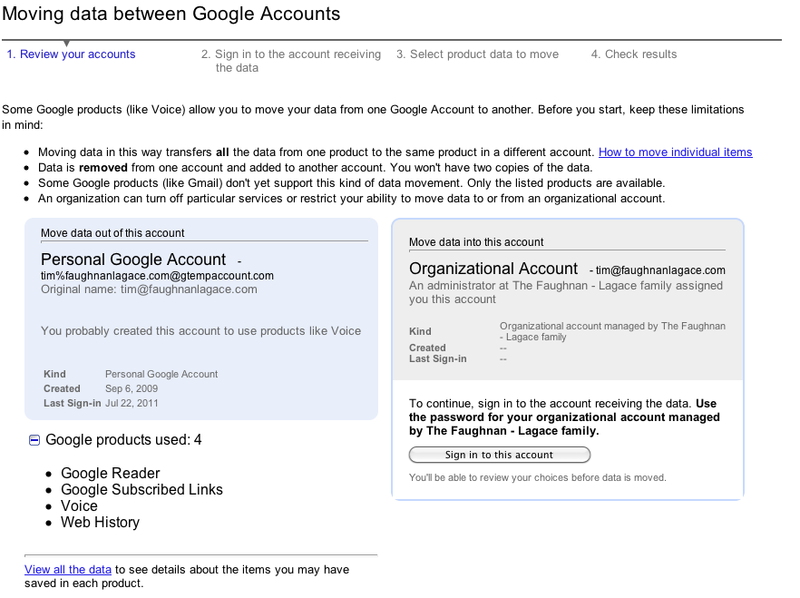 Here's the problem, which Google calls conflicting accounts. Consider the Google Apps domain "skynet.com" and a user "hal@skynet.com". Hal uses google mail at skynet.com, but he doesn't actually have a Google Account. He's merely a Google Apps person. A year ago Hal wanted to sign up for Google Voice. To do that he needed a Google Account. So he signed up for one using his email address hal@skynet.com for his username. Note he won't get email this way, but he can get everything else Google provides. 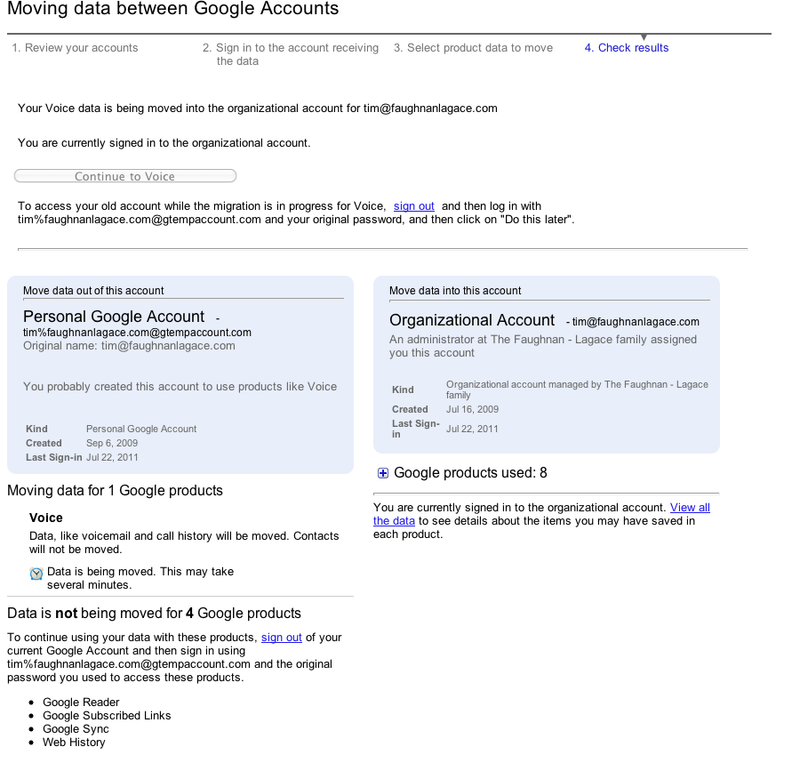 Meanwhile, Google wants to unify their infrastructure and unite their Google Apps accounts with their Google Accounts. Every Google Apps user will now get a Google Account and most Google services (I don't think G+ is available for Google Apps users however). Eventually Google moves Skynet.com to the new infrastructure. Now we have a problem. 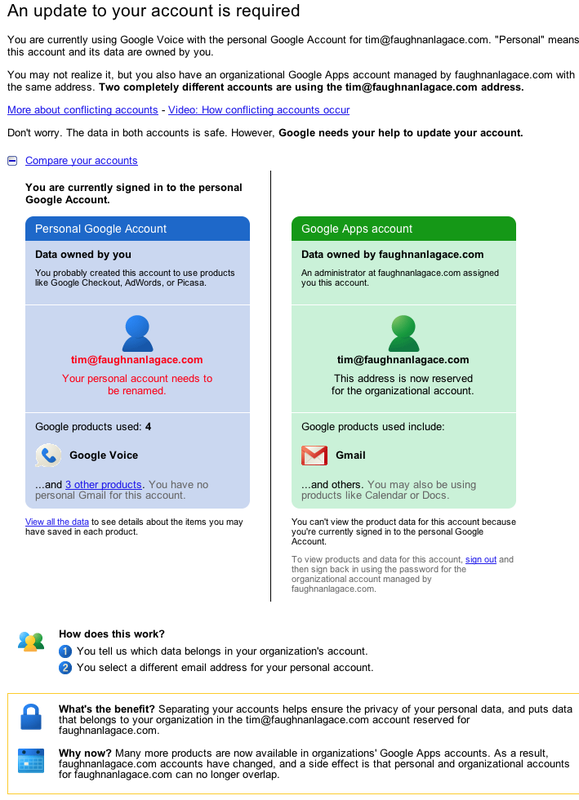 The username hal@skynet.com now has two potential Google Accounts. The old one with Google Voice and the one Google just created. This has to be resolved. 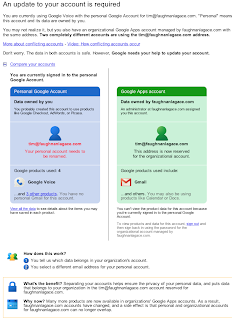 Hal can either change the username for his older Google Account, or he can discard his old account and merge a very few services into his new Google Apps Google Account. Phew. Reread until your head hurts. Anyway, I'm now doing this for Emily and my son Tim, both of who have to resolve this conflict now that Google has forcibly upgraded our family domain to their full service range. (Which is mostly good, except for this merger business). It turns out this works pretty well for Google Voice -- except you lose any old GV contacts. 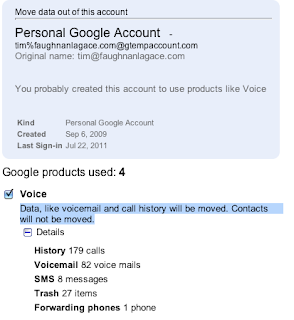 You begin the process by logging into your Google Voice account with your preexisting Google Account credentials. Then you're told you can either rename or merge. If you merge you can still access your old data (for a while) under a new username of the form: name%old_domain.com@gtempaccount.com. Here's how it looked after its done. 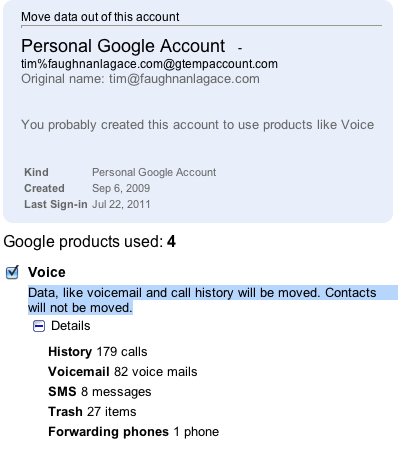 Tim really only used Google Voice, so his migration is pretty simple. Emily used a few services, I'll have to do manual data migration for these. 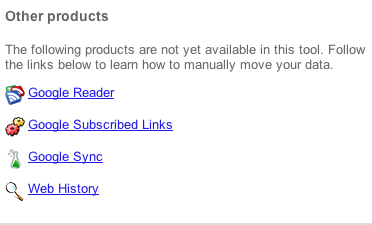 Losing the Google Reader records are particularly painful. In particular "... this process will only move your feeds, and will not move your trends, followers, people you are following, folders, shared links, or other information associated with your Google Reader." Really, it's a pain. I expected Google would manage this better, but it is what it is. Update: I ran into several small and medium bugs during the process. The worst bug is that Google continues to route logins to the conversion screens even after conversion has been completed. Read a post from November 2011? How did this post make it past the City Desk Editor? We thinks you meant 2010 .. 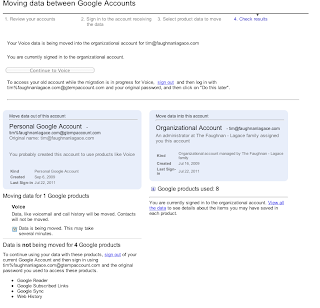 I was lucky enough that I never used the same mail address for my Google (Gmail) account and my Google Apps account. 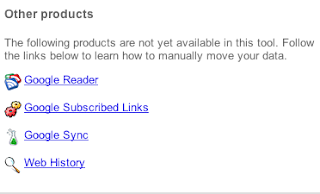 There's still the problem, however, that I cannot migrate Google Reader from my Google account to my Google Apps account because I would loose all the persons I'm following including John Gordon. I made a desperate attempt to migrate these persons manually but failed miserably since Google Reader didn't produce a search result for most of the names. * Gmail (including Google Apps Mail) allows for other sender mail addresses than the account mail address. There's only one catch: People with Microsoft Outlook still see my account mail address, e.g., not the business/association/etc. mail address I wanted them to see. It looks unprofessional to the mail recipient and messes up my filters for incoming mail. * Google Apps support recommended to switch from using domain aliases to adding those domains as 'other domains'. That worked, there was only one catch: 'Catch all' was broken for 'other domains'. Since I use different mail addresses all the time, i.e., for mail subscriptions, social networks, etc., I could simply not set up all mail addresses actually in use and had to switch back to domain aliases. @jJacob. I fired the bum. He was spending too much time on Facebook anyway. @Martin: Google does too many half-baked things. Seems they know that but they have a lot of bodies to bury.